The solid color blazer, once a masculine item, is being reclaimed by the women of the 21st Century, and they are making it look a whole lot better than men ever could. Pairing it with the likes of colorful dresses and raged boyfriend jeans, women truly know how to compliment this masculine staple. This young lady wears her navy blazer with the sleeves cuffed below the elbow. Underneath she has a white tee with horizontal navy chalk stripes. Her loose fitting jeans are tattered and stained, and are rolled up, showing off her pristine Converse low tops. This young woman adds a bit of youth to a refined look. Underneath her black blazer she has a tan burnout, scoop neck tee, which she has tied at the bottom with a hair tie. To compliment the low neckline she uses a beautiful pearl necklace. Her white skinny jeans are a great contrast to the blazer, while ending just above her black ballet flats. Jumpsuits are very trendy this Summer, and it seems the more intricate the pattern, the better. This first woman wears a tank jumpsuit with a plunging V neckline, and a black and white splatter pattern. She wears a copper Renoir cuff belt that helps to keep the loose fabric tight around her waist. The legs of the jumpsuit sit dangling above the ankle, where the black t-strap sandals start. The copper belt adds a balanced touch of color to this black and white outfit, as do her manicure and pedicure. This young lady takes a break from her day to check her phone, while sitting on the back stoop of the Equinox SoHo. Her spaghetti strap jumpsuit isn’t void of color or pattern. The purple background is a vibrant color, and allows for the tan tiger stripes to pop. The gold necklace with turquoise inlays helps to dazzle her soft swooping neckline. Her belt, bag and flats are all of matching brown leather. This uniform, neutral, color scheme helps to keep the emphasis on her lively jumpsuit. Blue and tan are two colors that go well together, just like earth and sky. These two young women have paired them together to create simple, yet tasteful outfits. This young woman sports a light-wash denim button down, which is left unbuttoned down to her waist revealing a white cotton scoop neck tee. The shirts are held tightly in the waistband of her tan, pleated, ankle-length skirt, with a braided, brown leather belt. Her tan wedge sandals and bleach splattered denim bag are relaxed accessories that help to make this a casual, yet chic, outfit. This young woman is wearing a denim button down with a western design. The open buttons and spread collar reveal a navy tank and the blue stones of her necklace. The abundance of blue in the top half of this outfit helps to give her blue eyes a bit of a pop. The shirt is tucked into the elastic waistband of a tan, pleated midi skirt, flowing atop a pair of brown leather wedges. The emerald leather bag adds another earth tone to the outfit, keeping it grounded. Spring is a time for colors. One color in particular has been standing out as a favorite for pants. 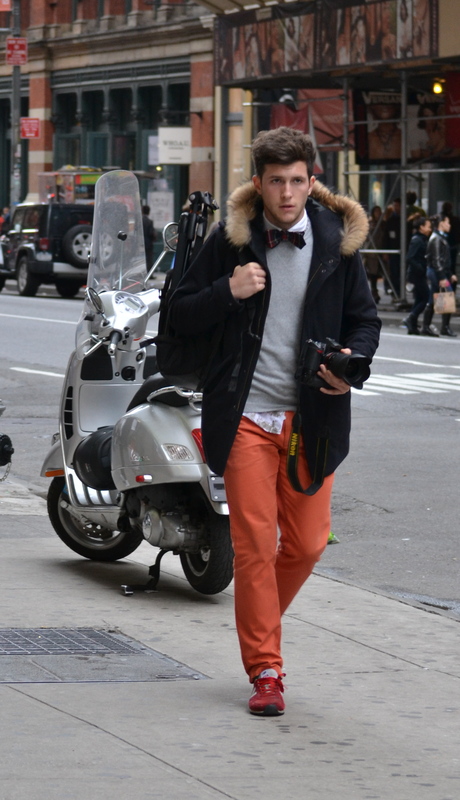 Orange pants seem to be popping up everywhere and in a multitude of styles. This lady has paired her orange skinny jeans with a pair of python pumps. Above the pants the style does not cease, with a ruffled, navy, button up blouse underneath a navy blazer with green and black horizontal stripes. The gold chains and pendants hanging outside the blouse and the grey Céline tote are great additions to this outfit. This woman also sports a pair of orange skinny jeans and adorns them with a black leather belt; the silver scaled flats below are a stylish accessory as well. The white deep V blouse adds a neutral color to the bold jeans and is also very easy to wear in the spring heat. The silken shawl adds a bit of color and a nice pattern to the rest of the outfit. This is a very refined outfit perfect for the office or the streets. The wide leg, orange pants have a loose fit, making them very airy and comfortable. The white button down, tucked into the pants’ wide waistband adds a dressier feel to the outfit, while the light coloring is perfect for the upcoming summer. The tan, soft leather blazer is another fashion forward item, perfect for the independent businesswoman. The black leather handbag is simple and elegant, making it an ideal addition to this ensemble. Here we have a male addition to this list. This young photographer has on a pair of straight leg, orange jeans, atop a pair of red running shoes. The neutral, grey sweater is a great combination, which does not take away from the color of the pants or shoes. The collared shirt underneath is adorned with a plaid bow tie, which is becoming a hot accessory for young men these days. The navy jacket with a fur-lined hood helps to keep him warm, while working quite well with the grey coloring of the sweater. Harem pants are all over the place right now. Originating in India more than 2,000 years ago, these loose fitting pants have become a very popular item on the streets of New York City. 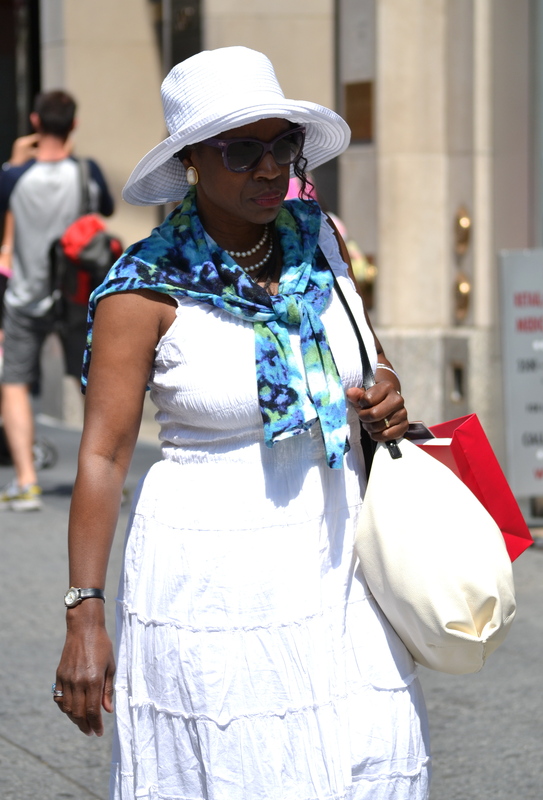 The loose fitting fabric allows for breathabilitly on those hot days in the Concrete Jungle. This young woman wears a bright pair of pink, extremely baggy harem pants with a simple white tank top. On her feet she wears brown leather, gladiator style sandals, which go really well with the tapered bottoms of the harem pants. It is an effortless look, but looks great. This young lady has paired her black harem pants with a sleeveless graphic tee, creating a Rock n’ Roll chic look. The black leather, fringed bag goes well with the overall color and style of the outfit, as do the black Chanel, T-strap sandals. This woman wears her black harem pants with gold toe loop sandals. 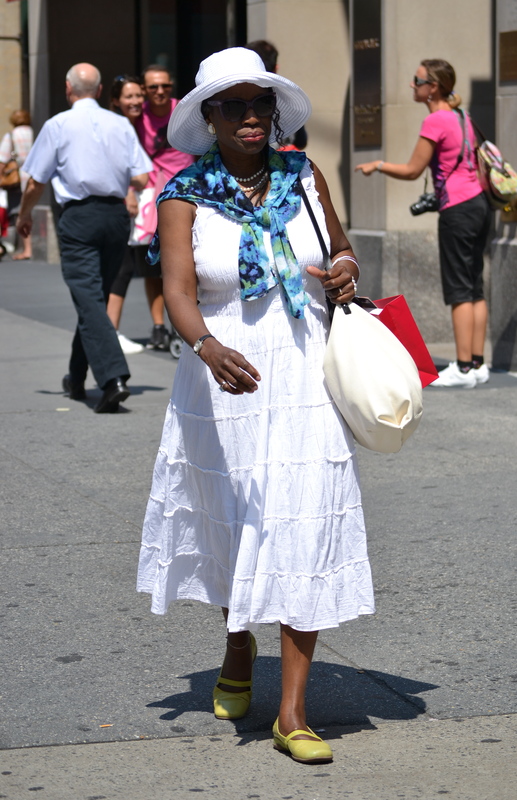 tucked into the pant waist is a sheer blue blouse with white polka dots. Around her neck the small scarf adds spring colors to the outfit.